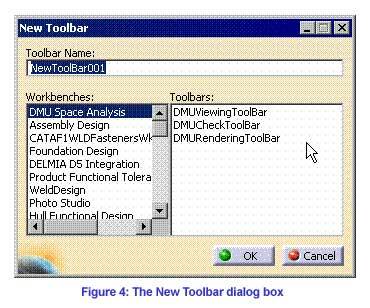 During the design process sometimes necessity arises where you have to import a toolbar in the current workbench from any of the other workbenches. 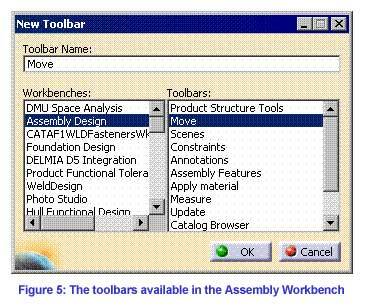 For example, while working with the DMU Kinematics workbench, sometimes it is necessary to perform certain tasks using the tools available in the Move toolbar in the Assembly workbench. 1.Select Start – Digital Mockup – DMU Kinematics to invoke the DMU Kinematics workbench. The default user interface for DMU Kinematics is displayed. 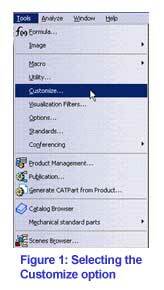 2.Select the Customize option from the Tools pull-down menu (Figure 1); the Customize dialog box is displayed, as shown in Figure 2. 3. Select the Toolbars tab from the Customize dialog box. The options available in the Toolbars tab are displayed, as shown in the Figure 3. 4. 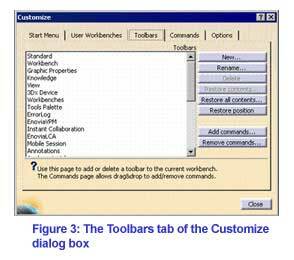 Choose the New button from the Toolbars tab of the Customize dialog box; the New Toolba dialog box is displayed, as shown in the Figure 4. 5. 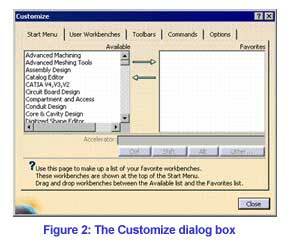 Select the Assembly Design workbench from the Workbenches area; all the toolbars available in the Assembly workbench are displayed in the Toolbars area. 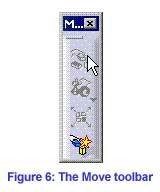 Select the Move toolbar from the Toolbars area of the New Toolbar dialog box. Name of the toolbar is displayed in the Toolbar Name edit box. See Figure 5. 6. The Move toolbar is now displayed in the DMU Kinematics workbench, Figure 6. Likewise you can import toolbars from any workbench.